The UK’s leading fitness presenter and creator of Kick Start Fat Loss (KSFL) Rachel Holmes has launched her very own Kick Start organic cold pressed virgin coconut oil. Ever the committed to helping the nation to lose weight and get healthy, Kick Start coconut oil is produced with quality in mind and is filtered in modern, hygienic conditions in Sri Lanka. Kick Start Coconut Oil is available in both a 460g and 920g tub. The large 920g tub is an economical and environmentally friendly way of buying Kick Start Organic Cold Pressed Virgin Coconut Oil as it will keep you going for longer and offers excellent value for money, the foil seal and screw top lid will ensure that your virgin coconut oil will remain fresh. Virgin coconut oil is growing in demand and popularity as the healthiest cooking oil and has a shelf life of two years. ‘It’s pure cold pressed virgin coconut oil that has not been hydrogenated, bleached, refined or deodorised. It comes from the finest coconut palms on the west of Sri Lanka which are grown using traditional farming methods and no pesticides. 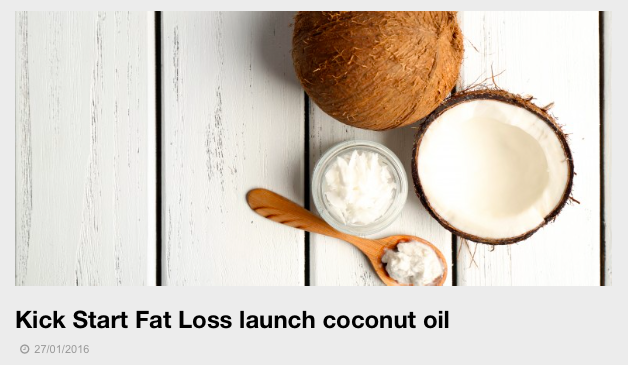 We use our coconut oil in all of our Kick Start Fat Loss cooking, as well as for skin and health care. The uses are almost limitless – it’s amazing,’ says Rachel.